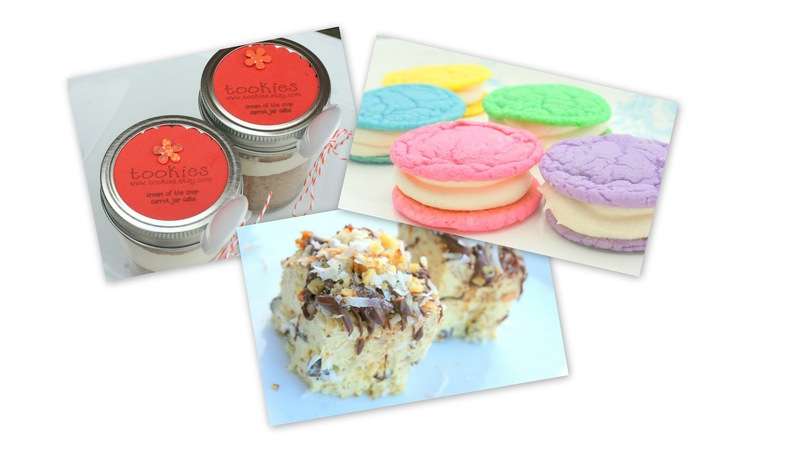 Tookies is an Etsy shop that makes gourmet sweets and treats that are as pretty as they are delicious. I have highlighted them as a sponsor before and I just love Tookies! You can find my other review with interview by clicking <<HERE>>. A spiced carrot cake layered with a creamy unique tasting buttercreme frosting. This cake was very moist and had a very nice level of spices added to it to compliment the carrot flavor. The frosting is so unique to me, it has an almost cream cheese flavor to it with a hint of vanilla. Jar cakes are so fun and special, ready to eat...really quite an experience. First of all, Tookies marshmallows are a meal! One marshmallow is so huge, you can barely open your mouth wide enough LOL. This marshmallow is banana flavored and filled with chocolate chunks plus pecan bits. The banana flavor is amazing, it is sweet but not too sweet and all those chocolate chunks melt in your mouth. There is more chocolate on top, chopped pecan bits, coconut and then the best part...crunchy sugar! The granules are large and they add the perfect contrast of crunchy to the soft mallow. We have declared this our most favorite marshmallow of all. These are so pretty! The cookies arrived to me in a pretty box all individually wrapped along with a slice of bread to help keep them moist. The buttercreme came in its own little container so that I could spread each one with as much of it as I pleased and boy did we pile the buttercreme on thick! I stuck mine into the fridge for an hour before we consumed them, it makes the frosting thicker and easier to work with. The cookies were so soft and smelled like sugary butter or was it buttery sugar....mmmmbutter. 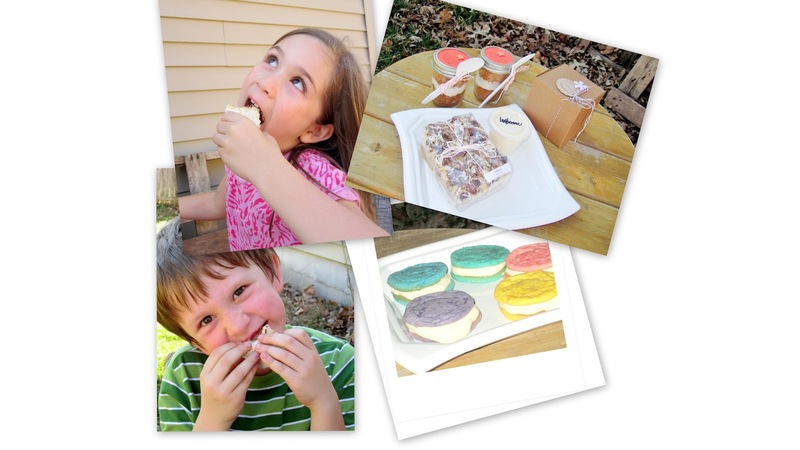 Tookies uses their own special french vanilla cookie recipe. These are so stinkin' good! You really just have to order some and try them yourself, it's almost too hard to put into words. My kiddos enjoying a very sweet little picnic with me outside on a warm spring day. **Tookies will be one of my sponsors in the Spring Buzz Giveaway Event beginning on March 22nd. Stop back on Mama-Nibbles to see what prizes we have in store for you. There will be a bonus surprise entry just for Tookies! It will be fun! Disclaimer: Tookies provided me with the items I have reviewed for free only to help facilitate my review. Getting these items for free in no way made me write a positive review, they are just that GOOD! All opinions are my own.